Actually, please allow me to clarify. It was only “great” in the sense that I got to see my friends exhibit the kind of fear they would normally reserve for a masked madman who has broken into their bedroom with a knife the size of a pitching wedge. Otherwise, it was terrifying. You’d know all about my Hummer antics if you followed me on Twitter, because I’ve recently been posting a lot of pictures from the driver’s seat. That’s because I’ve spent the last two weekends cruising around the city, trying to find friends who would drive the Hummer on camera. This primarily involved showing up at their homes or businesses, parking outside, and blasting the Hummer’s horn until they agreed to come down, drive the Hummer, and sign a waiver that excused me from any liability involving injury, death, or ridicule, in case any of their friends should see them behind the wheel. So what happened? Well, I created a video of everyone’s reactions to driving the Hummer, which I’ve attached below for your viewing pleasure. But I’ve also decided to document the whole thing using the written word, for those of you who have never experienced the joy of hearing the phrase “I haven’t driven a car in three years” only seconds after you’ve handed over the keys to a 6,600 pound vehicle designed to traverse countries that have more land mines than restaurants. 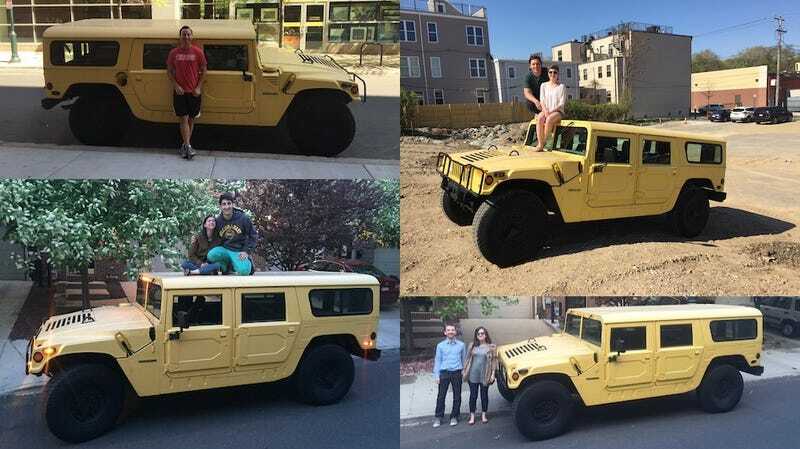 To start, here’s a rough outline of what happened: virtually everyone was scared to drive the Hummer. In fact, I think people were even more scared to drive the Hummer than they were to drive my Ferrari, the last time I did this. When you drive the Ferrari, you’re driving a normal car that’s a little more powerful, and a little lower, and a little faster than usual. When you drive the Hummer, you’re driving an enormous, V8-powered behemoth the size of a guest bedroom. People seemed acutely aware of this fact. So aware, in fact, that two people openly refused to drive the Hummer on public streets, preferring instead to guide it slowly around a parking lot until they were overcome with the fear that they might accidentally crush an animal, or a curb, or a family having dinner in their two-story suburban home. Among the people who did drive the Hummer in public, nearly everyone remarked that they were driving with absolutely no idea how wide it is, how far over in the lane they were, and where its edges were located. Several people thought they were taking up two lanes when they weren’t, while others cruised down the street blissfully unaware that they were driving several feet into the bike lane. This is not a comforting situation when you’re sitting in the passenger seat of a 20-year-old vehicle whose sole safety measure involved a bunch of engineers in Indiana grafting on as much steel as possible to every single surface, including the turn signal stalks. Size wasn’t the only complaint about the Hummer. Nearly everyone who drove the Hummer insisted that something was wrong with the accelerator pedal because it didn’t really start moving the truck unless it was jammed to the floor. In fairness, they are right, in the sense that something is wrong with the accelerator pedal. Namely, it is mounted in a Hummer. And the drawbacks didn’t stop there. Although I’ve always felt the Hummer’s visibility is pretty good, on account of the fact that it has roughly the same window surface area as that giant glass pyramid in front of the Louvre, most people who drove it complained that they couldn’t see a thing. People also complained about the ride quality, the acceleration, the steering, and the cabin noise. And then, after all these complaints, and grievances, and disapproval, most people left the Hummer with one last parting comment: “This isn’t as bad as I thought.” Considering how much criticism the Hummer got, I’m not sure what they were expecting. Possibly death. And this brings us to the most interesting part, which is that virtually every single person who drove my Hummer seemed to genuinely enjoy the experience. Despite all the initial terror, everyone ended up laughing, and smiling, and giggling. Some people even admitted that they actually liked the thing as they cruised down the street, behind the wheel. I, meanwhile, held on for dear life and quietly informed them when they were about to run over a bicyclist.